Award winning Hillam Architects certainly made a bold statement on apartment living when they designed Aria. Renowned in Perth for their opulent and innovative designs, the architects lived up to their reputation with these world-class apartments. 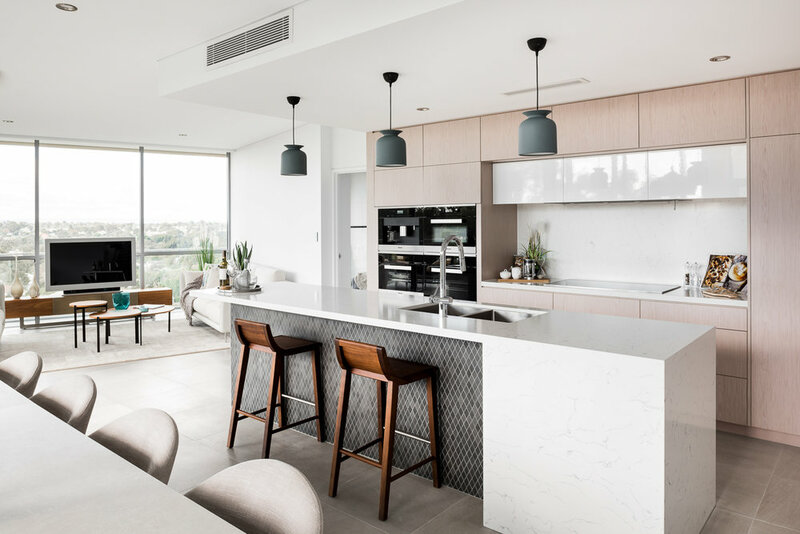 Perched in Swanbourne, Aria Luxury Apartments sit proud amongst lush landscaped gardens in its coastal locale. It’s no mean feat designing a high-end complex for a 6552sqm site that not only reflects the high-end design aesthetic of its exclusive suburb, but also embraces the sweeping views to their fullest extent. Yet exploring the architecture both inside and out, you’d be forgiven for thinking you were inside an exotic resort where no cent has been spared. Each detail is meticulously thought out, from the contrast of sharp angles which have been warmed by feature timber to create a cohesive yet intriguing look, to the metallic gold anodized aluminium screens that instantly create interest from the outset. Bespoke craftsmanship laces the building as do high-end finishes and a modern colour palette of white, black, greys and nature tones. A clever U shape protects the communal pool and entertainment space from summer breezes, meaning its lucky residents can utilize the space all year round. Not to mention the private gym, dining room, residents only lounge, yoga room and wine cellar. Hillam Architects have proved once again they are the masters when it comes designing luxurious, modern day living spaces.